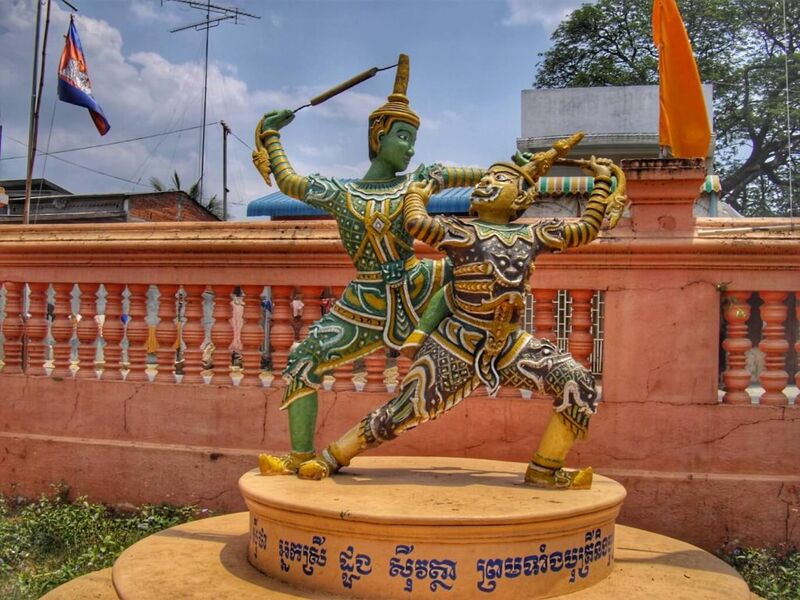 You will be visiting Cambodia soon and wondering if you should visit Battambang? Many travellers only include Angkor temples when they visit Cambodia, making the country a short extension to their trip to Thailand. However, Cambodia has much more to offer than Siem Reap and its temples. Battambang is one of them and I explain why I loved this city and the things to do in Battambang in this article! Battambang was a perfect stopover on my way from Phnom Penh to Angkor temples. Another reason to stop there was to take the boat from Battambang to Siem Reap, a beautiful itinerary of several hours that allows you to enjoy the beautiful landscapes of the Khmer countryside while observing life along the Mekong River, the Tonle Sap and their floating villages. A journey of 8 to 10 hours depending on the water level and direction – faster from Battambang to Siem Reap. Things to do in Battambang: Discuss with Buddhist monks. Lunch in a temple of Battambang. 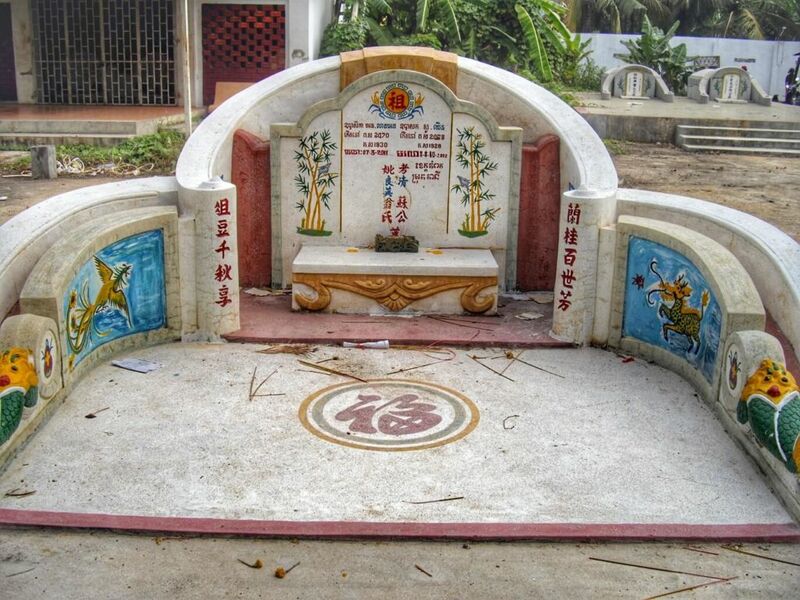 Things to do in Battambang: Discover the Khmer cremation rituals. Participate in a cremation procession. Visit of Wat Ek Phnom and night of cremation. 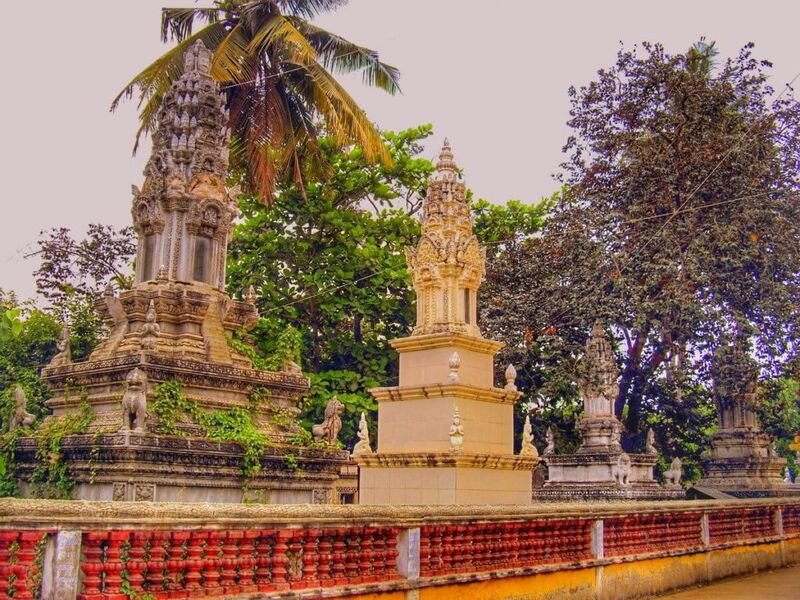 I started walking on the flat road to Wat Ek Phnom, an Angkorian temple 12 kilometers from the city, I thought I would quickly leave Battambang after a few visits to the most important pagodas on the way. So I started to visit a first pagoda whose staircase represented the sea of milk churning. This famous scene from my favorite book, Ramayana, is often represented on temple walls and I saw it much later in the Angkor temples. The next pagoda was a place extremely revered by the Khmer people, especially the monks, where they learned everything in Pali, the sacred language of southern Buddhism (Burma, Sri Lanka, Laos, Thailand and of course Cambodia). Its young leader is particularly respected for his important knowledge. All the monks walk around with a mini-radio to listen to the sacred texts. The place is so famous that monks come from all over the country to study and have to share cells for four or five people because there is no room. Funny detail: a group of French people arrived and was very surprised to see that I was sitting quietly with the monks. It reminded me of the prejudices I had before I met the Burmese monks in Thailand, when I thought that a woman could not talk to Buddhist monks, or become friends with them. Depending on the movement, the interactions allowed between Buddhist monks and women can be very different. Of all my travels, Cambodia was the place where relations with monks were the least strict. A few meters farther away, many people were leaving a temple, and I was immediately invited to sit on the floor and share lunch with a group of women: rice, vegetables, fish, and even colourful and sticky rice cakes, fresh mangos. One of the women spoke a little French. She explained to me that they had prayed and made offerings in homage to three monks died a few years earlier. Before I left, I wanted to take a picture of them. Without delay, everyone started to laugh as they arranged their hair and outfits. It’s a whole part of the pagoda cleaning group that will be in my picture, proudly sitting in front of the altar! In the courtyard, the statues represent scenes of the fighting of the Râmâyana. This famous Asian mythological epic is common to many countries: Indonesia, where one of the most famous shows for tourists takes place at the Prambanananan temple near Borobudur (a show for the local population can last all night); India where there are many performances of Kathakali with scenes of Râmâyana; Thailand, Burma, Malaysia, Laos. If you want to make the most of your travels in Asia, this is a must read! you will find my favorite version below. While my visit to northeastern Cambodia was marked by wedding invitations, my visit to Battambang was marked by cremations and burials. As I continued walking on the road to Wat Ek Phnom, I once again turned off following the music I heard and discovered a place prepared for a cremation. The music then led me to a house where a funeral was held. Immediately, a young woman asked me to sit down and discover the ceremony. One by one, the guests, dressed in white, came to our table to give money. Their names and the amount of the donation were written on a notebook, and the banknote was put in a silver cup. A red bracelet was attached around one of their wrists. 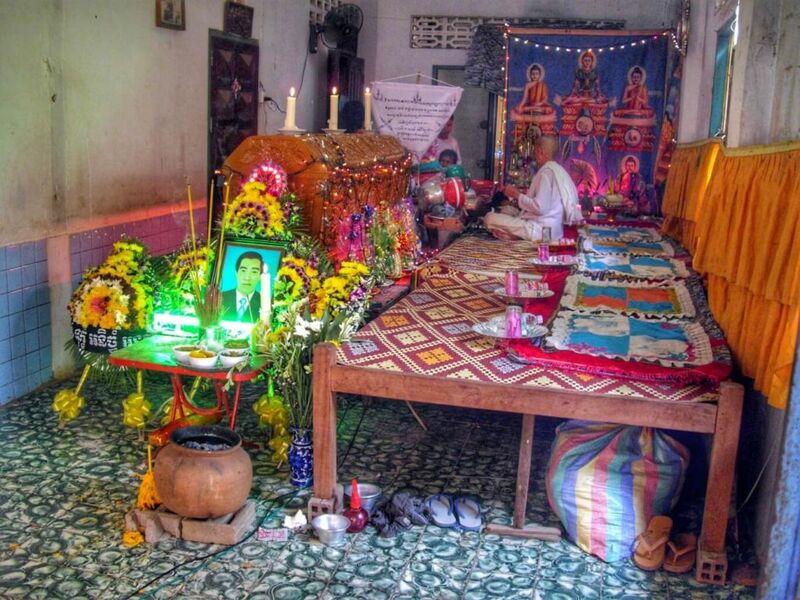 In Khmer belief, this avoids the escape of the nineteen souls, such a ceremony being particularly favourable to a mixture of the souls of the family and guests with that of the dead. Three incense sticks, attached together with a bank note and decorated with candy and flowers, were given to everyone. 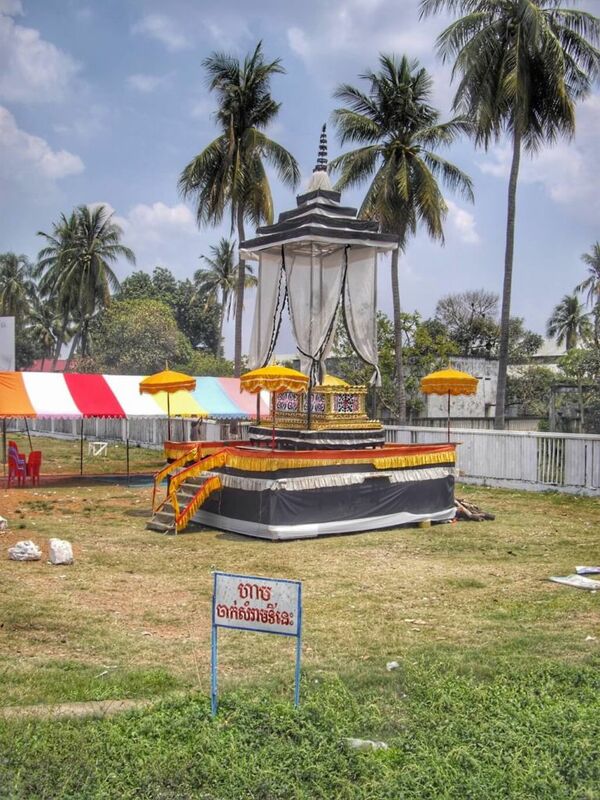 The incense will be given to the family once arrived at the cremation site. Meanwhile, the parents prayed around the coffin, decorated with flowers, candles and light garlands. There was the picture of the dead man, food and drink offerings, incense and candles on a small table. A green light illuminated the picture, which will give a strange feeling to a Chinese friend who will look at my picture later (for her, green represents the color of ghosts in China and you can never use this color of light). The monks were present. The family prayed with them and offered them offerings. Gradually, the decorations on the coffin were removed. The family was photographed with the coffin, as I had already seen in Toraja on the Indonesian island of Sulawesi. Their clothes were covered with a kind of white paper suit. The men were wearing a white headband with a golden rectangle, while the women were wearing a headdress of the same colour. A young man was wearing different clothes and had a special function. I think he was a young monk, a relative of the deceased, who was come especially for the cremation. 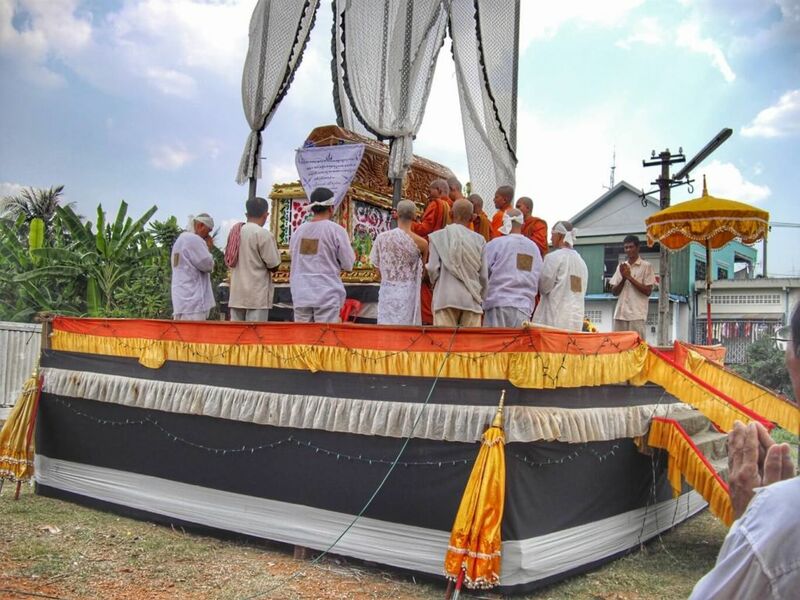 The coffin was placed on a vehicle filled with green plants and the monks took their seats with the master of ceremonies, the family and the odd-looking young monk. The master of ceremonies made him a crown of greenery and put it on his head. The procession began and we went around the village before reaching the cremation site where the coffin had been placed. The monks and the family turned around three times. Then the parents went to the platform to pray in front of the deceased. The monks (except one) and the young man left at that time. The family will pray with the master of ceremonies and the monk all afternoon. The monk will explain that the dead man drowned. Meanwhile, one of the guests took me to Aek Phnom on his motorcycle. When we returned, we were invited in for lunch with the family. During the cremation, the family continued to pray, the monk was sitting in a meditative posture, without moving. The platform was illuminated and people were chanting sacred songs if they wanted to. Despite the kindness of my driver, I found it safer to return to Battambang on the scooter of the young woman who had invited me for the cremation, but unfortunately I was unable to attend the cremation pyre. Ona’s parents were worried about her outside at night and we had to return early. 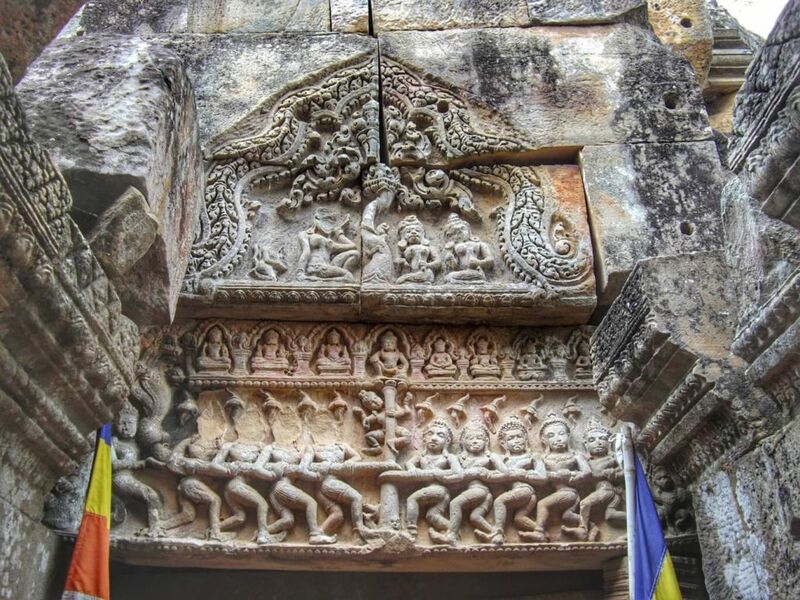 Battambang has been a great place to discover Khmer culture, through its temples and ceremonies. I would include it in the best places to visit in Cambodia. Even if you only plan to stay here for a short time on your way from Phnom Penh to Angkor temples, I strongly recommend that you visit Battambang and some of its temples. Let yourself be carried away by its quiet little town atmosphere. 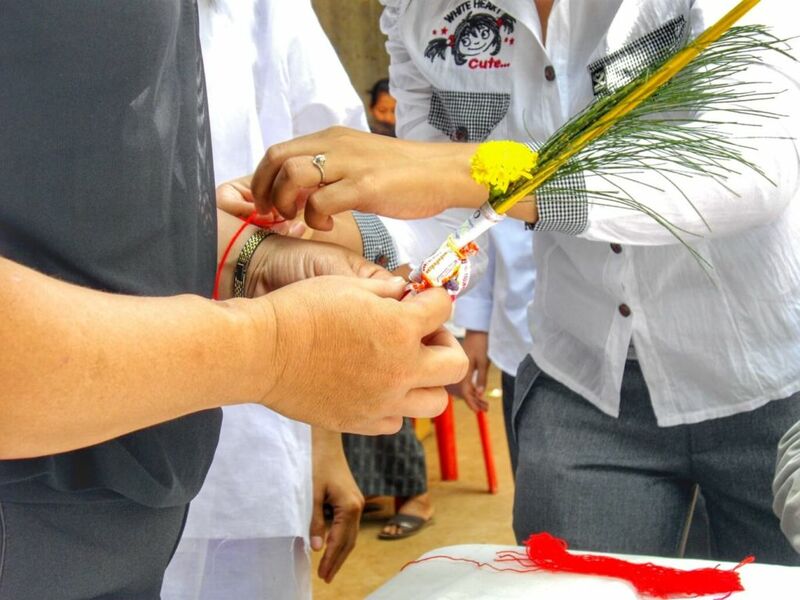 If you want to learn about wedding rituals in Cambodia, you can read my article about a wedding in Stung Treng here. And you, have you ever visited Cambodia? 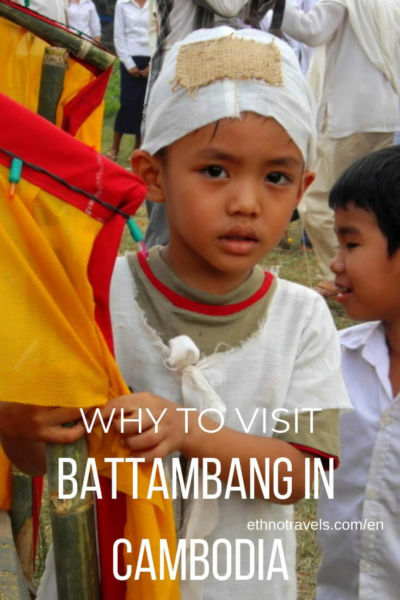 Why would you recommend visiting Battambang? Do you have any tips to share? 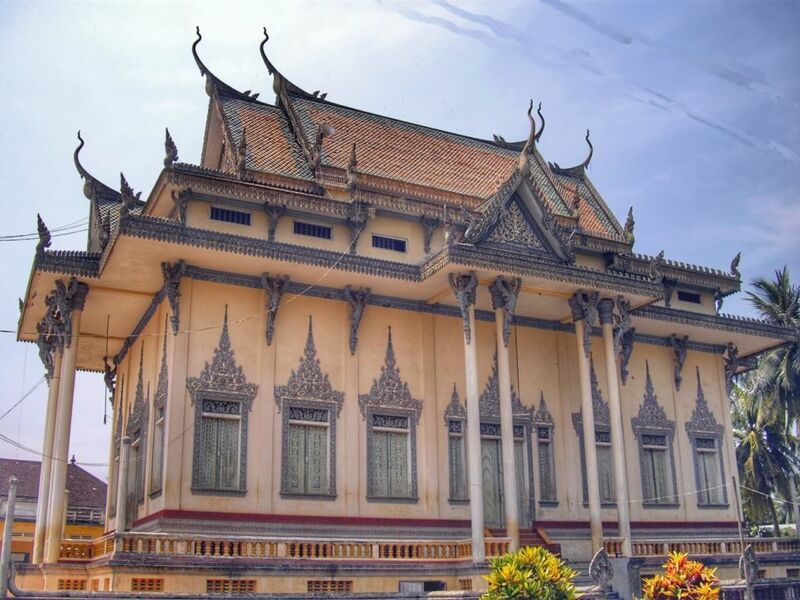 Will you visit Battambang on your next trip to Cambodia? Tell us about it in comments below! This article may contain compensated links. Read the legal notices of the site for more information.